In the past ten years the UK's electricity mix has changed dramatically. Coal's contribution has dropped from 40 percent to 6 percent. Wind, solar power and hydroelectric plants now generate more electricity than nuclear power stations, thanks to rapid growth. 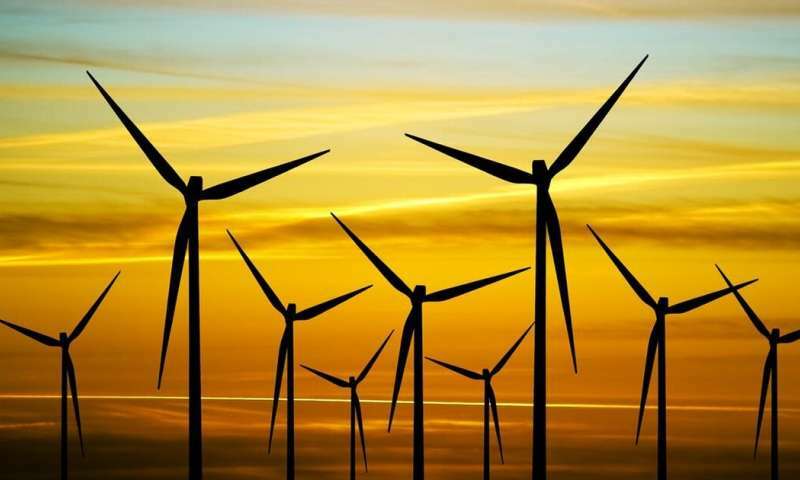 Demand for electricity has also fallen, reducing the country's dependence on fossil fuels. Thanks to these three factors, the carbon intensity of Britain's electricity has almost halved, from more than 500g of CO₂ per kilowatt-hour in 2006 to less than 270g in 2018. Already approaching that milestone on windy, sunny days, the country's first hours of 100 percent low-carbon electricity could soon be here – but staying at 100 percent throughout the year will be much more difficult to achieve. So what does the journey to decarbonisation look like? To paint the UK's energy future, it is important to first understand how electricity is generated today. The graph below is a visualisation of British electricity generation in October 2018. 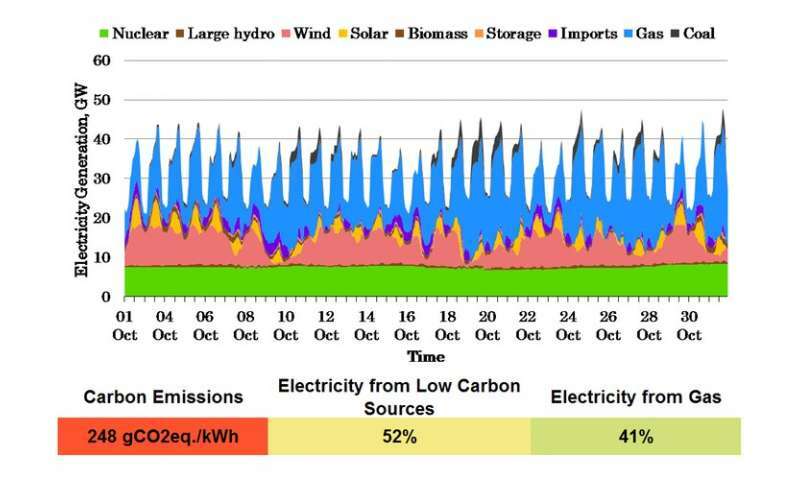 Periods of strong wind (in red) and sun (yellow) combined with nuclear power (green) meant that on some days, more than 75 percent of electricity came from low-carbon sources. With solar prices still decreasing and the government recently agreeing a major deal for offshore wind to produce one-third of the UK's power by 2030, the country's first hours of low-carbon power could arrive within the next five years. But the graph also highlights the other side to the UK's energy story. 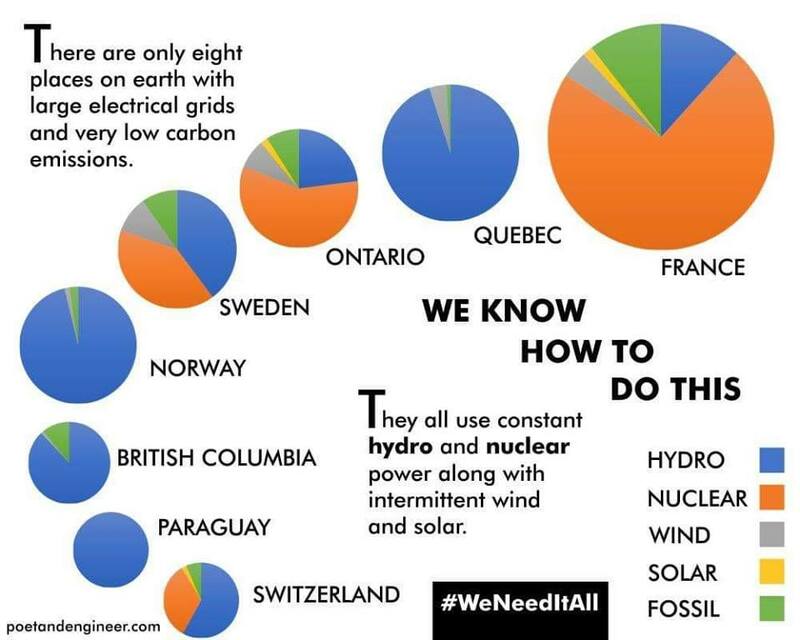 When the wind is weak and the skies dark, low-carbon sources provide less than 25 percent of electricity generation. On average, low-carbon technologies accounted for more than 45 percent of British electricity in 2018 – and almost half of that came from nuclear plants. Saying goodbye to fossil fuels quickly might mean accepting that the ever-controversial form of energy will play some role in the UK's electricity mix in the medium term. Similarly, plans to decarbonise the UK's heat generation – currently 66 percent is generated by gas – by converting to electric heating systems will also place huge pressures on demand. During winter months, heat can consume more than three times the daily energy demands of electricity – and over a full annual cycle it constitutes 50 percent of total energy demand. Collectively, these factors will move the goalposts for 100 percent low-carbon electricity further and further away. While the huge efficiency increase of electric vehicles over internal combustion engines should cushion the impact of electric vehicles on the UK's energy future, the country will need to diversify its energy mix as much as possible to bring those goalposts back into sight. This means continued growth in wind, solar, hydro, biomass, energy efficiency and energy storage to carry the country through the calm, grey days. 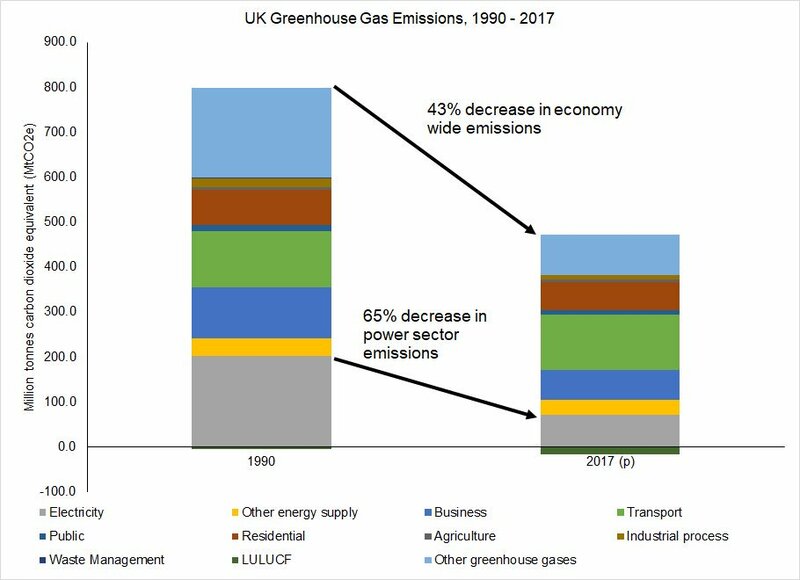 Precisely how much growth is needed depends exactly on the future of energy demand, but to give some perspective of scale, more than 80 percent of the total UK energy supply, including electricity, land transport and heat, still comes from fossil fuels. The tens of billions of pounds already invested in low-carbon electricity is just the start of the UK's journey to decarbonised energy. "Demand for electricity has also fallen,..."
Demand for electricity has fallen thanks to expensive renewables. "In Britain, the price of residential electricity increased by 27 percent in just a decade. Germany and Britain both have heavily invested in wind power and have higher residential electricity prices..."
"...the carbon intensity of Britain's electricity has almost halved..."
"If the UK embraces the task, it could be joining Costa Rica..."
"Wind, solar power and hydroelectric plants now generate..."
"This means continued growth in wind, solar, hydro, biomass,..."